May 27, 2015 brought the 200th anniversary of the birth of Sir Henry Parkes. After he died, the London Times described him as "a colonial colossus." Henry Parkes received little schooling and worked on a rope-walk, breaking stones, as an ivory and bone turner, ironmonger, laborer, and on the wharves before trying business life and ultimately politics. He and his first wife traveled to Australia on an assisted passage. 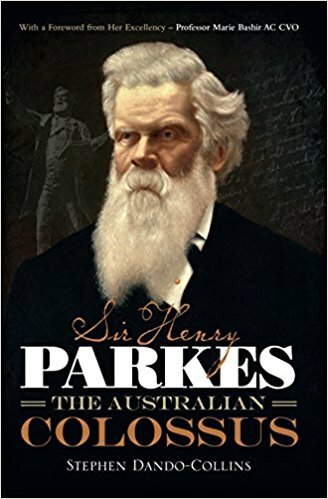 There has never been anyone else like Sir Henry Parkes in Australian public life. Not only was he the father of federation, but his friends included Thomas Carlyle, fellow poet Lord Tennyson, and British Prime Minister Gladstone. He convinced Florence Nightingale to send trained nurses to Australia. He conceived the international rabbit competition which led to the Pasteur affair and put Australia at the forefront of microbiology. He encouraged talented men to enter politics, yet he shunned the limelight, rarely attending social functions. Whenever he received begging letters, (which he did, daily), Parkes always wrote back enclosing money. No wonder he went bankrupt three times! Yet he was Premier of New South Wales 5 times, leaving its finances well in the black every time. He married three times, the last time to a 23-year-old beauty. Clearly, Parkes loved women, and they loved him. He encouraged women to attend political meetings, and long advocated the vote for women. But not everyone loved Sir Henry; he had a long-running feud with poet Henry Lawson's mother after Parkes wouldn't give young Lawson the help she demanded, and he constantly wrestled with political aspirants chasing his seat. It all added up to a colossal life.